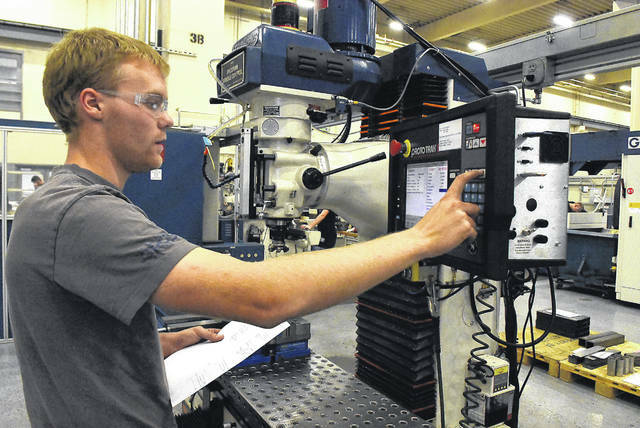 Lucas Gerding, 20, a mechanical apprentice at Grob in Bluffton, programs a Proto Trak DPM5 milling machine on Friday. Gerding is a second-year apprentice. Lucas Gerding, 20, a mechanical apprentice at Grob in Bluffton, said he appreciates his apprenticeship program because he’s not accumulating college debt while he gains valuable skills. LIMA — Apprenticeship programs in Allen County have helped people like Lucas Gerding, a second-year Grob Systems Inc. mechanical apprentice, follow his dreams and go to school debt-free. Gerding decided to join the Grob apprenticeship program because he was inspired by his brothers who were mechanical engineers. “I watched them work at Honda, and I wanted to follow their footsteps, but I didn’t want to pay the cost of a four-year school,” said Gerding, 20. A high school diploma or a General Educational Diploma are the only requirements for becoming an apprentice. Apprentices who go through apprenticeship programs at Grob or at UA Local 776 Plumbers and Pipefitters union can receive college credit or even earn an associate’s degree without having to pay. Grob and UA Local 776 Plumbers and Pipefitters fund the education and provide their apprentice free training. Reimbursements from Allen County OhioMeansJobs can help companies fund apprenticeship program. This week is National Apprenticeship Week, a week dedicated to celebrating apprentices and apprenticeships across the country. The apprenticeship program through UA Local 776 Plumbers and Pipefitters also offers college credit for its apprentices. The union has a partnership with Owens Community College where the apprentices can earn up to 36 college credit hours through their course work and training at the training center. UA Local 776 Plumbers and Pipefitters offers a five-year apprenticeship program at its training center on 1300 Bowman Road in Lima. During this program the apprentices work during the day and take courses at night. Through the courses, the apprentices learn about different topics such as welding, rigging, plumbing, math and science. Each year of the program, the apprentice are given more and more responsibilities. At the end of the five years, the apprentice then becomes a journeyman and is matched and employed by contractors. Apprentices who are going through the programs in Allen County typically earn wages above $13 an hour and receive various company benefits. Each year an apprentice completes in the program, their wages are raised. Individuals who are interested in joining an apprenticeship program at UA Local 776 Plumbers and Pipefitters can stop by the office on 1300 Bowman Road from 8 a.m. to 4:30 p.m. Monday through Friday. The Grob apprenticeship is a four-year program for mechanical and electrical apprentices. Grob is a Germany-based machine industry company located in Bluffton on 1070 Navajo Drive. Apprentices in Grob’s apprenticeship program spend the first two years doing general training. During this time, the apprentices explore various departments to get a broad overview of what the company does, said Mike Hawk, Grob mechanical training supervisor. During the second year, the apprentices go through technical training, where they will spend their time on the floor at a machine shop or building a panel. Aside from the general training and courses taken at Grob the first two years, the apprentices also take courses at Rhodes State College. Rhodes State College partners with 12 area companies for their apprenticeship programs. “Partnering with companies gives us a really direct connection with our local industries, and we are able to help with their workforce needs,” said Margo Meyer, Rhodes State College’s director of advanced manufacturing initiatives. Individuals who are interested in joining the apprenticeship program at Grob are encouraged to attend the open house tour from 9 a.m. to 11 a.m. on Dec. 8. At Rhodes State College, the apprentices take two years worth of courses and earn either an associate’s degree in manufacturing engineering technology or in electronic engineering technology. They will also receive a State of Ohio Apprenticeship Completion Certificate. Through the course work, apprentices learn how to create parts for companies, how to build control panels, how to connect different pieces of the assembly line and about welding and fabrication. Gerding said he really enjoys the courses that he takes at Rhodes State College because he can easily apply what he has learned. 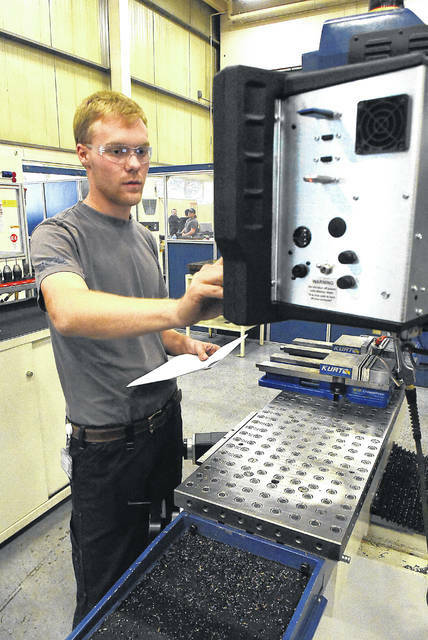 https://www.limaohio.com/wp-content/uploads/sites/54/2018/11/web1_Mechanical-Apprentice_01co.jpgLucas Gerding, 20, a mechanical apprentice at Grob in Bluffton, programs a Proto Trak DPM5 milling machine on Friday. Gerding is a second-year apprentice. https://www.limaohio.com/wp-content/uploads/sites/54/2018/11/web1_Mechanical-Apprentice_02co.jpgLucas Gerding, 20, a mechanical apprentice at Grob in Bluffton, said he appreciates his apprenticeship program because he’s not accumulating college debt while he gains valuable skills.